I’ve never read anything by Richard Jeffries. I figured BLOOD DEMONS would be a great start. I wasn’t wrong. This book gets off to a literal bang and ends on a high note. Lyrical Underground has been putting out some great books from great authors. If you haven’t checked out the publication, then you should. Their upcoming lineup looks good. Some of my favorite authors are publishing books through them. Anyways, let me get to this review. When I say the book gets off to a bang, I really mean it. A couple throws a bomb strapped child off the top of Mount Rushmore, reducing it to ruin. Major Josiah Key, commander of the secretive Cerberus Unit, is dispatched to hunt down the mastermind responsible. The unit receives a tip that leads them to mysterious caves where the Vetela dwell. The Vetela are unholy creatures who inhabit the bodies of the dead and the source of all vampire legends. I love the military aspect of this book. There’s a lot of action and death. Some of the scenes will turn your stomach. I could definitely see this as a cult film. I thought the premise was unique. The characters were developed pretty well, but there wasn’t a character that stood out above the rest. I liked all the characters, though. The writing was solid. 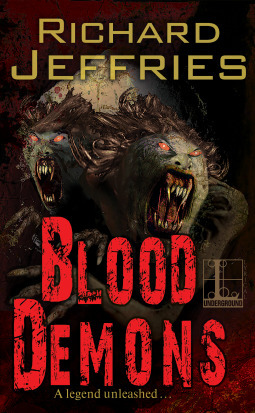 Overall, BLOOD DEMONS was a solid read.